Calling attention to the advantages of ATA Carnets for Moroccan companies, three training workshops, organized by the Casablanca Chamber of Commerce took place last week in Casablanca, Rabat and Tangiers on 8, 9 and 10 October respectively. The ATA Carnet System for the duty and tax-free temporary admission of goods entered into force in Morocco in 1998. Since then, Morocco has received more foreign ATA Carnets than it has issued Carnets for use abroad. The awareness-raising workshops aimed to redress the balance by spreading ATA knowledge among Moroccan chambers, customs and companies. The Casablanca workshop gathered over 260 participants from all sectors of the economy, including freight forwarders, transporters, and production companies, import/export businesses, banks, insurance companies, public administrations, customs officers, chambers of commerce and embassies. 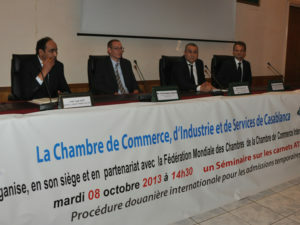 Presentations, by Xavier Fetter (Paris Ile de France Chamber), Christophe Coulie (Belgian Chambers), Driche Abdallah, Ahmed Jaid and Noureddine Houtate (Moroccan Customs) as well as executives of the Casablanca Chamber, gave very practical examples of how Carnets are managed and function worldwide. Discussions highlighted the need to change the way Carnets are issued in Morocco to make them more easily accessible to companies and adapt the ATA System management to the economic and legal context. One of the conclusions reached by the workshops was that chambers and customs should work together for the benefit of the public and private sectors. This is in line with ICC’s mission to eliminate barriers to international trade. The ATA Carnet, the so-called passport for goods, is an international customs document that facilitates the temporary admission of goods into other countries without the need for normal customs procedures. It is a success story of public-private partnership as it is jointly administered by the Brussels-based World Customs Organization – the depository of the international conventions on the temporary admission of goods – and the Paris-based International Chamber of Commerce – the administrator of the international ATA guarantee chain. More than 175,000 ATA Carnets are issued yearly for thousands of customs transactions worth over US$ 25 billion. Goods covered include professional equipment, commercial samples and material for trade fairs and exhibitions. Some examples of note include: a prototype solar car, World Cup yachts, Giorgio Armani apparel, McLaren Grand Prix cars, Munich Symphony Orchestra instruments, Australian Olympic horses, Harley Davidson motorcycles and equipment for the Bolshoi Ballet, Cirque du Soleil, BBC and CNN.